STONE FRUIT REFERS TO FRUIT LIKE CHERRIES, PEACHES, APRICOTS AND PLUMS. THEY ARE IN SEASON BRIEFLY IN THE SUMMER IN INDIA. 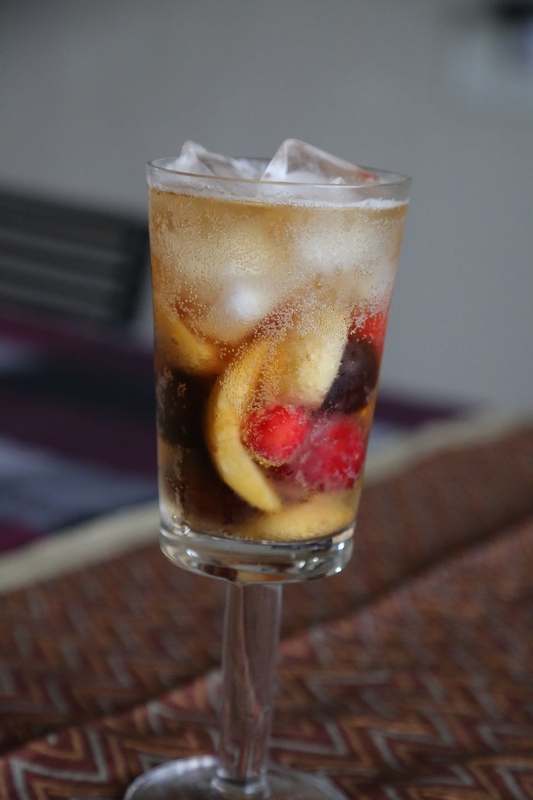 IF YOU WANT SANGRIA THAT CAN SIT AROUND A WHILE, REPLACE THE SPARKLING WINE WITH A FLAT WHITE WINE. SOAK ALL THE FRUIT, STICKS OF CINNAMON, POWDERED SUGAR IN THE ORANGE LIQUEUR, WHITE PORT AND BRANDY OVERNIGHT. BEFORE SERVING REMOVE CINNAMON STICKS. ADD THE FIZZY WHITE WINE AND STIR WELL. TASTE AND ADJUST SWEETNESS. POUR INTO HIGHBALL GLASSES HALF FILLED WITH ICE. SPOON OUT SOME OF THE FRUIT INTO EACH OF THE GLASSES. DECORATE WITH A SPRIG OF MINT AND SERVE IMMEDIATELY.